For decades, millions of drivers passing through Emeryville saw an ever-changing array of giant statues along the bayshore. 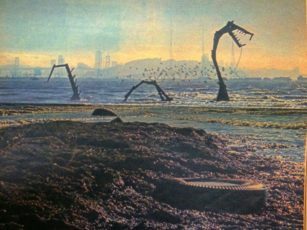 In addition to the towering wooden vikings, dragons and other whimsical creatures, activists used driftwood and trash to build monumental projects responding to the tumultuous political era. This story traces the rise and fall of this “renegade drive-thru art gallery” and explores the concept of public art. Featuring interviews with Joey Enos, Tom Enos, Denise Neal, Lincoln Cushing and Tim Drescher. Rob Arias, the publisher of community news site The E’ville Eye, is also a member of the Emeryville Historical Society. In this interview, host Liam O’Donoghue talks with Rob about E-ville’s notorious reputation as a “the rottenest city on the Pacific Coast,” the town’s Ohlone heritage, and much more.